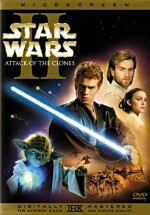 The Clone Wars takes place between Star Wars: Episode II - Attack of the Clones and Star Wars: Episode III - Revenge of the Sith. Jedi Knights Anakin Skywalker and Obi-Wan Kenobi continue their journey across the galaxy amongst the Clone Wars, meeting up with familiar villains, such as Count Dooku, General Grievous and Asajj Ventress. The Grand Army of the Republic, led by Yoda, Mace Windu, Obi-Wan Kenobi, and other Jedi Knights, must fight the New Droid Army of the Separatists. $14.611 million on 3452 screens. • Audio Commentary with Director Dave Filoni, Producer Catherine Winder, Writer Henry Gilroy and Editor Jason WA Tucker. After 2005’s Revenge of the Sith, Star Wars fans thought they’d seen the last of the saga on the big screen. Nope – though Sith may turn out to be the series’ last live-action epic, 2008’s animated The Clone Wars gave the franchise a fresh cinematic presence. Set during the period between Attack of the Clones and Sith, Clone Wars focuses on Jedi Anakin Skywalker (voiced by Matt Lanter) and trainee Ahsoka Tano (Ashley Eckstein). Though Anakin doesn’t desire a Padawan, Yoda (Tom Kane) sticks him with Ahsoka. After a rocky start, Anakin starts to warm up to Ahsoka, and the pair embark on a special mission. Members of the Separatist Army kidnap the son of Jabba the Hutt (Kevin Michael Richardson), so Yoda sends Anakin and Ahsoka to assist with the search mission. Why does the Republic come to the aide of a notorious gangster? Because they need to ensure safe passage through Hutt-controlled territory. Of course, this mission won’t go without a snag. Separatist Count Dooku (Christopher Lee) plots to frame the Jedis and land on Jabba’s good side himself. To that end, he sends Sith mistress Asajj Ventriss (Nika Futterman) to do his dirty work. Fans may be forgiven if Clone Wars causes them to suffer a sense of déjà vu. 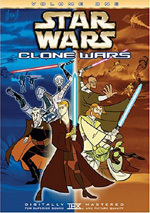 After all, a collection of animated adventures under the “Clone Wars” banner already appeared during 2003-05 as a run-up to the theatrical release of Sith. Would the theatrical Clone Wars just provide more of the same? No, as both projects serve different purposes. 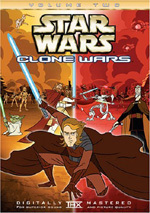 The 2003-05 Clone Wars shorts acted to provide narrative to connect Attack of the Clones and Sith. They allowed fans to make more sense of Sith and helped move along the Star Wars saga. On the other hand, the 2008 Clone Wars falls more into the “Continuing Adventures of Anakin Skywalker and Pals” vein. The theatrical flick acts as a preview of the current Cartoon Network Clone Wars series and doesn’t fit into the Star Wars mythology in the same way as the prior Clone Wars material. This effort stands on its own and serves to give us more Star Wars fun without the burden of telling a unified tale. It succeeds to some degree. The story side of things acts as the flick’s weakest element. To say the least, a plot to rescue Jabba’s kidnapped son doesn’t exactly provide galaxy-shaking material, and the movie can’t quite elevate the subject matter to become anything memorable. Since every live-action Star Wars movie gives us epic events, it’s a bit weird to see something this small-scale. Sure, lives are endangered and whatnot, but an entire film based around an attempt to secure a navigation path doesn’t scream “big-screen adventure”. Ironically, though, Clone Wars works best when it focuses on its minor plot. In its early moments, it tosses us into a broader global theme – and fails to engage us. One of my main complaints about the three prequels comes from their convoluted stories. As I mentioned when I reviewed the 2003-05 Clone Wars, I barely understood the first half of Sith even though I’m a lifelong Star Wars diehard; George Lucas made the prequels stupidly complicated. Fans could easily digest the tales found in the Original Trilogy so we could then better focus on the characters and the drama; it becomes annoying that we so often get lost in the prequels because the stories don’t make sense. After the opening, that doesn’t turn into an issue with Clone Wars. Again, on one hand, that acts as a disappointment, since we’re able to see the feeble nature of the story. On the other hand, though, the simplistic focus turns into a relief; at least it allows us to get past the convoluted shenanigans of the prequels and simply enjoy the action. And when Clone Wars focuses on its battle scenes, it does pretty well for itself. Despite some clunky animation, the movie looks absolutely gorgeous, and the action sequences provide some stirring material. We get the usual effective lightsaber battles and a few good space fights to help carry us past the pedestrian nature of the story. A few of the original actors appear here. We get Samuel L. Jackson in a brief turn as Mace Windu as well as a short appearance by Anthony Daniels as C-3PO. Christopher Lee plays the biggest part of the returning performers; he’s really the only one whose role elevates above “blink and you’ll miss him” territory. The replacement actors do quite well in their parts. Lanter is a little too broad as Anakin, but then again, Hayden Christensen never exactly lit up the screen. Other substitutes offer quite credible impressions, and they act the roles nicely too. In terms of characters, the weakest links come from some of the new personalities. Ahsoka starts as an irritant and never really rises above that level. Eckstein plays her with a perkiness more suited for the Disney Channel than for an aspiring Jedi, and her sassy interplay with Anakin never feels right. I’m sure the Cartoon Network series will show her maturation, but for now she’s too Hannah Montana for me, and she harms the movie. Another bizarre misstep comes from Ziro the Hutt, Jabba’s uncle. Sure, it’s cool to see another Hutt in action, but why’d they make him some sort of jazz hepcat? I guess the film’s producers didn’t want him to be a Jabba clone, but the character odd to me. Despite these mild complaints, I mostly enjoyed Clone Wars. I see that it’s gotten a lot of negativity, and I can understand many of the gripes. However, most of the barbs also apply to the prequels, so I don’t think that Clone Wars deserves particular animosity. This isn’t great Star Wars, but it’s a pleasant diversion. 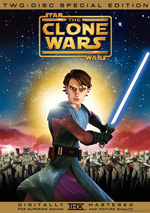 Star Wars: The Clone Wars appears in an aspect ratio of approximately 2.40:1 on this single-sided, double-layered DVD; the image has been enhanced for 16X9 televisions. At all times, the flick boasted a stunning transfer. Sharpness looked terrific. Not a hint of softness emerged here, as the movie always seemed concise and well-defined. I noticed no issues connected to shimmering or jagged edges, and edge enhancement also failed to materialize. Of course, the computer-animated affair came without source flaws, so don’t worry about any specks, marks or other defects. With a wide range of exotic settings and characters, Clone Wars featured a broad palette that looked great. The movie’s colors leapt off the screen, as they offered excellent vivacity and impact. Blacks were concise and dark, and shadows seemed clear and well-defined. This was one of the best-looking transfers I’ve seen in a while. Since the Star Wars flicks always offered stellar soundtracks, I hoped for something special from the Dolby Digital 5.1 audio of Clone Wars. Unfortunately, Clone Wars wasn’t the sonic equal of its live-action predecessors. That didn’t mean it lacked effectiveness, though, as the track usually worked pretty well. The soundfield was the main area that dropped in quality when compared to the live-action Star Wars films. Those efforts contributed engrossing soundscapes that really immersed us in the action. While Clone Wars kept us in the flick, it didn’t match up with the earlier movies. The track usually maintained a forward emphasis, especially during the story’s early moments. Matters opened up as they progressed, though they never became as active as I’d hoped. Nonetheless, the audio created a pretty good sense of environment and utilized all five channels in a satisfying way. As one might expect, the many battle sequences worked the track the most. These continued to display a focus on the front, where elements moved smoothly across the spectrum. The surrounds added good information throughout the flick; they simply weren’t as vivid as I’d anticipated. Still, they used the channels well and added to the experience. Audio quality satisfied. Speech always remained natural and concise, and the lines meshed well with the action. Music tended to get buried in the mix to some degree, but the score showed reasonable life and vivacity. Effects came across as full and accurate. Low-end response was dark and tight, so expect some solid bass. All of this made Clone Wars a solid “B+” soundtrack. This two-disc set includes a good mix of extras. On DVD One, we get an audio commentary from director Dave Filoni, producer Catherine Winder, writer Henry Gilroy and editor Jason WA Tucker. At least some of them sit together for this running, screen-specific piece; Winder appeared to be solo. They cover visual design, cast and performances, score, story and editing, new characters and elements, animation issues, collaborating with George Lucas, and various challenges. The folks behind Clone Wars offer an informative – if uninspiring – chat. They cover the nuts and bolts of the flick’s creation with reasonable depth, and they give us a good picture of the different issues that arose. I most enjoyed the times when we heard of how much involvement Lucas had in the process, as he did more for Clone Wars than I’d have expected. Overall, this is a generally interesting piece. DVD One also opens with an ad for the Cartoon Network’s Clone Wars series. With that we head to DVD Two, which starts with some featurettes. Star Wars: The Clone Wars - The Untold Stories goes for 24 minutes, 51 seconds and includes notes from Filoni, Winder, Gilroy, and executive producer George Lucas. “Stories” essentially provides a preview of the lone Wars TV series. It discusses the stories and characters who will emerge during the show. That means it feels more like a commercial than anything else, though I must admit it makes me look forward to the show. During the 10-minute and one-second The Voices of Star Wars: The Clone Wars, we hear from Filoni. He discusses the cast of the movie/series and their work. I like the parts that show the actors at work, as they provide some nice glimpses of the performances. However, too much of “Voices” stays in the same promotional mode found during “Untold Stories”. More information appears here, but it still feels an awful lot like an ad for the series. A New Score goes for 10 minutes, 45 seconds and features Winder, Filoni, and composer Kevin Kiner. As expected, we get notes about the series’ music here. Kiner offers some interesting thoughts about his work, especially in terms of how he tries to connect with John Williams’ iconic movie music but not simply impersonate his predecessor. Next we find a Gallery. It shows 42 images; we see concept art and other planning materials. I like these stills, but the format isn’t great. The DVD puts a big border around all the images, so they’re smaller than they could’ve been. Nonetheless, the quality of the stills makes them worth a look. Six Webisodes fill a total of 20 minutes, 56 seconds. These are little promotional clips that ran on the Internet. Across them, we hear from Filoni and Winder as they cover the series’ new characters and situations, battle scenes, clone warrior design, and character development. Here’s a shocker: the “Webisodes” exist to advertise the series and include very little real information. They achieve their promotional goals and are fine for what they are, but they don’t tell us much to turn them into a substantial DVD supplement. Four Deleted Scenes last a total of 10 minutes, 49 seconds. They include “Through the Tanks” (0:49), “Rancor Pit” (4:02), “Platform Droid Fight” (4:12) and “Cargo Bay” (1:45). Normally deleted scenes offer minor character bits and nothing particularly dynamic, but these clips take a different direction. All but “Tanks” – which is just a little extra story info – offer battle scenes. They’re quite fun, so I wonder why they didn’t make the final cut. They’re definitely entertaining and good to see. In addition to the ubiquitous Digital Copy of Clone Wars, we get a few Trailers. The disc provides two ads called “Launch” and “Dark” along with a promo for the Clone Wars videogame. If you expect a mind-blowing epic piece of Star Wars adventure from The Clone Wars, you’re likely to end up disappointed. If you expect a lightweight piece of fun, you’re more apt to feel satisfaction. The movie doesn’t excel, but it entertains. The DVD gives us stunning visuals, very good audio, and some erratic extras. Though Clone Wars isn’t a classic, it gives us a good time. I expect most fans will be satisfied with the single-disc edition of Clone Wars. It replicates DVD One from this set, so you lose the second disc of extras. However, that’s not much of a problem, as only the deleted scenes are particularly interesting. While the two-disc set isn’t much more expensive than the single-disc option, I still think it’s the best option for most.